The day time run on Thursday took crews from Rockhampton to Brisbane for a 30 minute “publicity” stop. There were only two competitive stages during the day, the first adjacent to Rockhampton and the second near Gin Gin. Not much changed although Brock took another couple of minutes off Ferguson and Carr continued to set fast times, making it look almost certain that he would take fifth place from Nalder by Sydney. This was another one of those pointless publicity stages but at 7 o’clock in the morning there was never going to be much of a crowd! It was a straightforward run alongside the Fitzroy River just outside of town. The stage was a bit rough and meandered among the trees but was otherwise uneventful. Brock was unexpectedly slow, perhaps a puncture or perhaps a clock error? Jackson continued to struggle dropping over 12 minutes, Beveridge had a problem dropping more than 23 minutes, while Lahiff had a major drama dropping over 40 minutes then skipping directly to Brisbane. Originally this transport stage was to have wound its way down the Boyne Valley and through Kalpower Forest but perhaps because of the risk of traffic on these quite narrow roads, the route was changed at the last moment to run straight down the Bruce Highway to the Kalpower Road where crew ducked into the start of a trial stage at Gaeta. Although the route was slightly longer, because it mostly used the Bruce Highway, the time was reduced by 15 minutes. This looked like a leisurely run until the new route chart turned out to be 10 km short and crews had to make a make dash for the end! Dunkerton was delayed and dropped 2 minutes and fell behind Portman, Nalder and Carr on the road. Watson dropped 4 minutes and Jackson 31 minutes. About 29 cars were on time but 27 cars lost under 10 minutes, whereas a further 20 or so cars lost more time, suggesting that they were bamboozled by the error in the route chart and unable to pull out the map and check where they were! Several cars that did the Rocky special skipped the next trial stage altogether and headed directly to Maryborough, Brisbane or beyond. This fairly straightforward run down the road from Gaeta to Wonbah was through undulating grazing country on a reasonable quality road. Other than a gate to be opened, the only real excitement was a old wooden grid near the end that had a rung out of place so cars had to crash through the gaping hole. 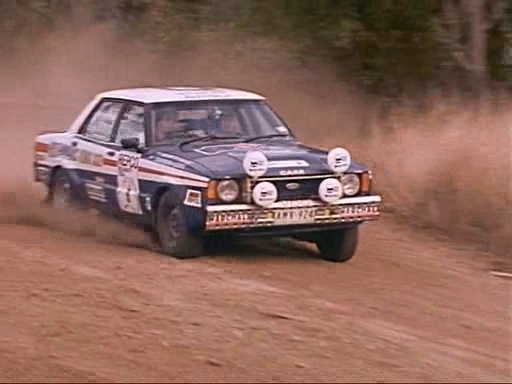 Carr continued to fly and passed the Nalder Celica at the gate. 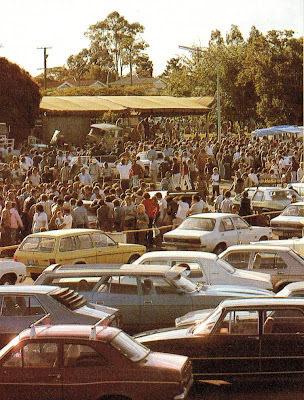 It was unclear why the transport to Brisbane was broken into two but there was a control in Maryborough, perhaps to allow the scores to be tallied and passed through to Brisbane before the arrival of the cars. It was 156 km from Wonbah to Maryborough down the Bruce Highway (this was before the building of the Maryborough bypass). Portman had some problem coming out of the competitive and was towed into Gin Gin – perhaps he had run out of fuel because he did not lose time, although he did drop back on the road several places. The first car was at the Maryborough control before midday but after checking in crews were able to continue on the transport to Brisbane. It was probably on this part of the Bruce Highway that the Parsons Mazda 323 rolled and retired. Hilton reportedly stopped to assist and was probably out of late running time anyway. A few cars lost time in Maryborough but many also booked in early to regain late time, including Mizel and Jackson. With the extra time being allowed out early from Maryborough, the time for the run to Brisbane was adequate, even though the stated distance was a bit short and the last 12 km was in quite heavy Thursday afternoon traffic. In fact some later cars that wanted to regain late time were able to book in up to an hour early (they must have been speeding!). The first car arrived at the Brookside Shopping Centre in Brisbane’s north-west suburbs at around 3.30 pm for a hold which would finally see the event back on schedule. There was a huge crowd in attendance including quite a lot of media. The rally had reached “the big smoke”. The first car departed at about 4.30 pm but there was a good deal of mayhem at the control point and if you didn’t front up to be booked out you had a good chance of losing road position. This happened to Carr who fell behind Nalder, Dunkerton and Portman on the road. Wes drove the Rockhampton Special Stage which was fun but rather pointless. We got new instructions for down the Bruce Highway so Geoff gave Wes a distance on the Halda to wake him and I also slept in the back. The new route chart was 10 km short so there was a mad dash at the end and we hurried up the Kalpower Road and into control with less than a minute to spare. Dunkerton was missing and Portman had departed in front of us with Carr arriving close on our tail. Geoff jumped in the back for a sleep and I drove the Wonbah stage. With only one instruction, Wes was not really navigating but he did have to open the gate! The stage was OK but with a few cattle on the road and some kangaroos so we took it a bit easy, letting Carr go past at the gate. The broken wooden grid at the end gave us a scare and at the control Fred Gocentas asked us how we had enjoyed it! I continued to drive all the way into Maryborough and we passed Portman being towed before we even got to Gin Gin. At Maryborough we made some phone calls and Geoff had a drive while I slept in the back and Wes dozed in the front. I awoke at a service station on the outskirts of Brisbane where Wes took over the driving through the traffic to the Brookside Shopping Centre where our service crew were present as well as Wes’ parents. 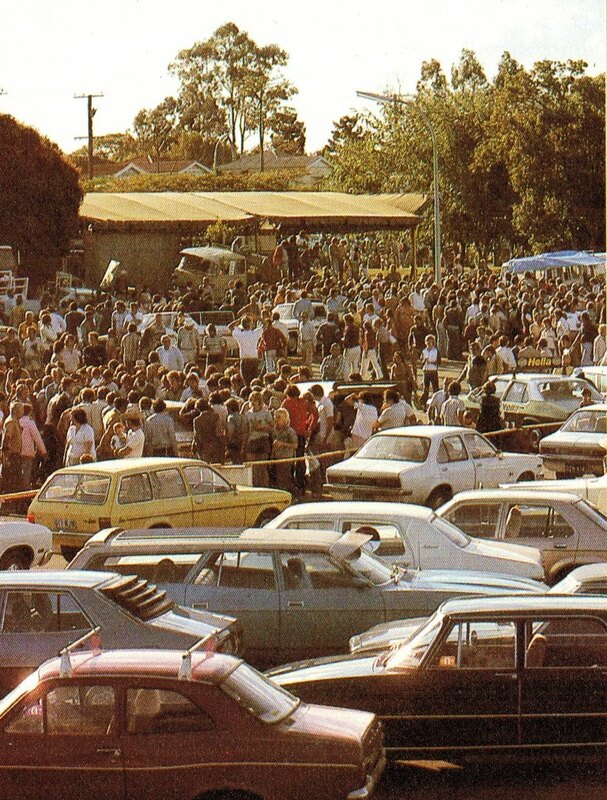 There was a big crowd including some of those bikini clad girls with the Repco tee shirts wanting autographs. Drew Morphett interviewed Wes but it wasn’t used in the ABC video. There was a bit of chaos and I knew we were due out soon so got the car lined up behind Mehta. Portman had arrived but was late and Carr was there but not lining up. When we departed Dunkerton seemed to be behind us.